I haven't been as regular with my art practice for a couple of weeks because of busy work-weeks but I have managed to keep up with the learning thanks to my online subscription to art websites. 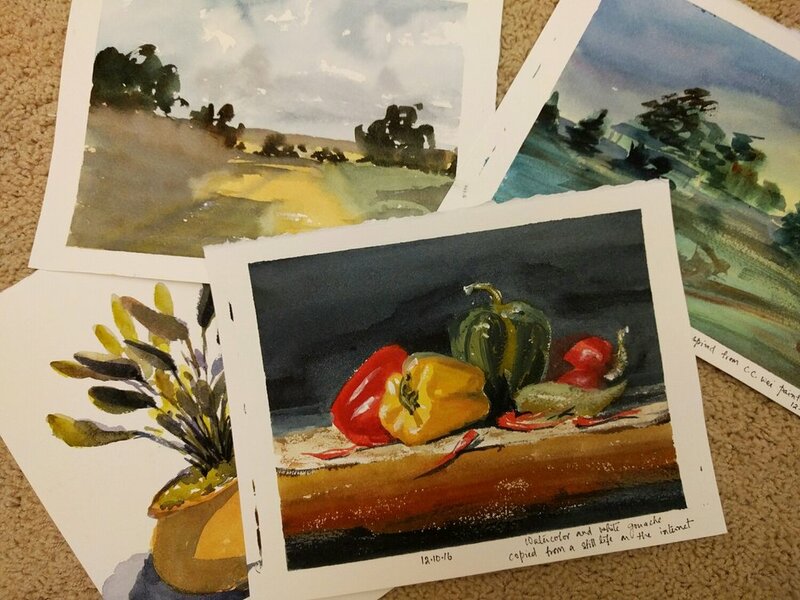 The one I have been following lately is Nathan Fowles' Landscape Sketching in Watercolor and Gouache course on schoolism.com. It is a fantastic resource if you want to get to the next level in what makes a good painting. The class covers principles and not so much techniques, and I really appreciate that. I have been doing some composition exercises in black and white for the class and that turned me onto observing and learning from paintings I admire and painting opaquely. The paintings I did this afternoon are all copies of paintings I admired online. I tried watercolor and Gouache in the pepper painting and I am very happy with the results. I cannot control the medium very well yet but I am happy with how things turned out so far.